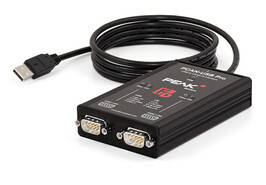 The PCAN-USB Pro FD adapter enables the connection of CAN FD and LIN networks to a computer via USB. Two field buses can be connected at the same time, up to four with appropriate adapter cables (2 x CAN FD, 2 x LIN). Each CAN FD channel is separately isolated against USB and LIN with a maximum of 500 Volts. Its robust aluminum casing makes the PCAN-USB Pro FD adapter suitable for mobile applications. PEAK-System takes this into account by supporting both protocol versions with their CAN FD interfaces. If required, the user can switch to the CAN FD protocol used in the environment by software („Non-ISO“ and „ISO“). Devices delivered until February 2015 need a firmware update for this functionality. If you are interested and for further information, please contact info@peak-system.com. The PCAN-USB Pro FD can be used alternatively for the PCAN-USB Pro, because this CAN interface is no longer manufactured! The PCAN-USB Pro FD behaves identically concerning the CAN and LIN functionality.